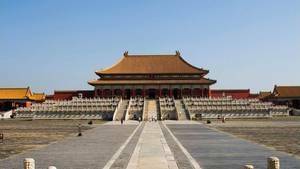 The Forbidden City is the name given to the imperial palace of feudal China. Built between 1407 and 1420, improved several times, it is the seat of the central power like the private residence of the emperor, its wives and his concubines. By concentrating all the powers of China in the same place, it is logical that this palace was the object of great veneration on the part of the people, but it is also the place where the main ceremonies necessary for the life were held. spiritual of the time. Like many other civilizations the feudal Chinese relied on a lunar calendar to count time. The main ceremonies that punctuated their lives were therefore based on the Moon. The first month of the lunar year was marked New Year's Eve, named "Chuxi" in Chinese. This ceremony was held in the large courtroom in the presence of the emperor. He received at dawn the tribute of the members of the imperial family and senior officials living at the Court, with him. This ceremony was lavish and of great importance, but it did not call into question national politics. It preceded the New Year's Day, called "Yuandan". New Year's Day was celebrated by the entire Chinese population. On this occasion we used to burn incense in honor of the spirits to invite them to go down to earth. Great fireworks were fired. What is common between burning incense and shooting fireworks is the relationship to heaven. But in the Chinese imaginary Heaven was a deity who chose a person to represent him on earth, a person who received a mandate to reign on Earth in his name. This person was the emperor of course, which explains why he considered himself the master of all the earthly people and not only the Chinese. New Year's Day was also taking place in the Forbidden City, of course. That day princes, dukes, officials and guards of the imperial antechamber could freely access the Forbidden City to congratulate the ruler who stood at the Palace of the Supreme Harmony. The ceremony was not especially festive, it consisted for the emperor to offer a purse to all the people present in the palace, respectively and in the order of presentation to the sovereign the princes, then the nobles, then the mandarins, who were in the court Supreme Harmony. These symbolic purses, they were engraved with the eight precious symbols (called "Babao") of Buddhism (the wheel of the law, the shell, the parasol, the baldachin, the lotus, the jar, the fish and the mystic knot). Once the ceremony was over the participants returned to their homes to give the omens back to their loved ones. On the Winter Solstice day, a similar ceremony was held, as well as military victories and Emperor's birthday. More precisely on the nineteenth day of the first lunar month, the Chinese celebrated the "Feast of Nine" ("Yanjiu" in Chinese). It was about organizing wrestling competitions as well as the reception of Mongol princes. This ceremony took place in the Petit Pavillon d'Or. During the second lunar month, Pavilion of Literary Glory was celebrated in the Classical Celebration where Illustrious scholars commented on the greatest classics before the Emperor. It was a sort of literary contest. On the 10th day of the lunar calendar, the astronomy specialists presented to the Emperor and his wife the New Year's Calendar, at the door of the Midday. This calendar included the dates of the various ceremonies planned. It was also at the gate of the South that the flagellations of the officials were passed through the central tunnel, reserved for the Emperor. In 1519, 158 officials were punished, 15 of whom were beaten to death. This cruel punishment was abolished at the end of the dynasty Ming. Some historians had come up with an idea which later turned out to be false, namely that Chinese troops, when they returned victorious from a battle, organized a sacrifice of prisoners at the gate of the South. In fact, it's wrong, this ceremony was held, but only for criminals, and it was held at the vegetable market in Beijing, not in the Forbidden City. In addition to participating in spreading the splendor of the Empire to his subjects, all these ceremonies kept the Emperor in the illusion of the greatness of China, while it was only an empire, certainly important, but not more so than others, starting with the European empires that were beginning to be built.